Learn how to align the goals of business and IT for better information governance and trusted information. Embed data integration, quality and availability in your data lake environment to accelerate insights and avoid data swamps. 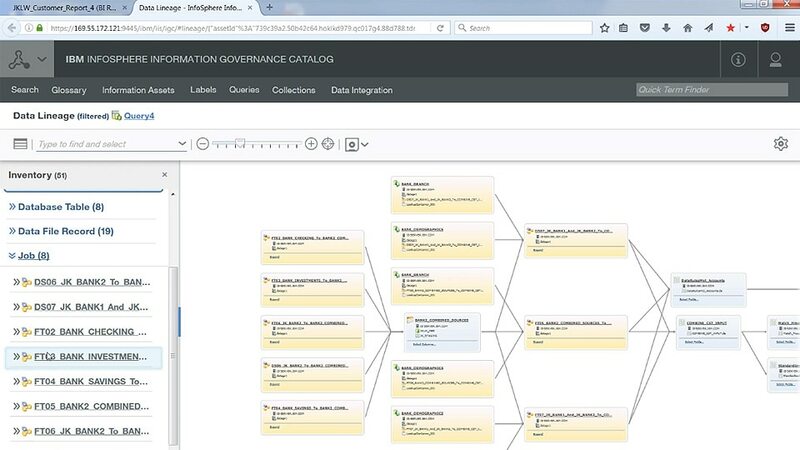 Learn how to take inventory of your data, understand its meaning and track its lineage. Access, curate, categorize and share data, knowledge assets and their relationships, wherever they reside with WKC. Enable a unified actionable view into all retention obligations for each data type across all your data sources. Learn how to help manage data by having the metadata stored inside the Catalog. Get a high-level explanation of how to help quickly and easily locate all PII data to comply with regulatory requirements. See how to help comply with industry regulations around managing and governing data using a banking industry example. See the value of having a data catalog and identifying relationships between data objects and business terms and metadata. Take advantage of machine learning and AI to analyze your data. Catalog your data to make it easy to find. In this analyst report, read about the growing need to treat information as an asset. IBM Watson Knowledge Catalog ranked as a leader by Forrester in machine learning data catalogs. QuadReal’s decision-makers need timely, accurate insight into portfolio data scattered across many disparate source systems. Jakarta Smart City wanted to identify areas for improvement by automatically collecting and analyzing feedback from citizens. Read about the importance of scalable data platforms that offer significant cost benefits. Explore bank regulatory imperatives and the related benefits of InfoSphere Information Governance Catalog. Includes business glossary terms, governance policies, data lineage, and integration with IBM Information Governance Catalog.